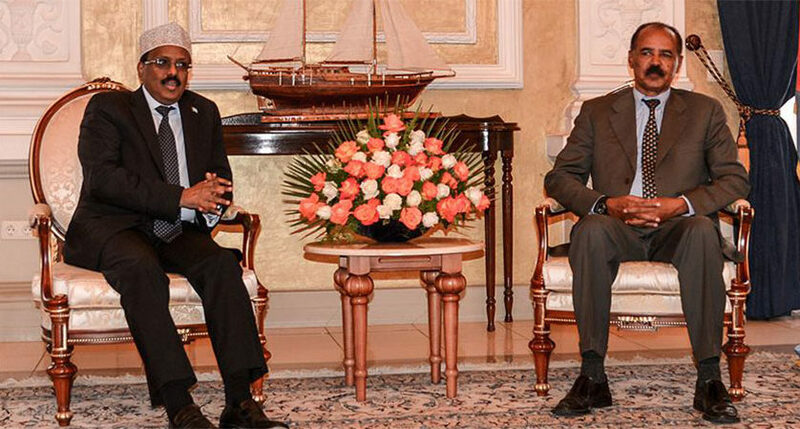 “The agreements made by the three countries will certainly help to bring these countries and other countries from the region closer ” – President Mohamed Abdullahi Mohamed. 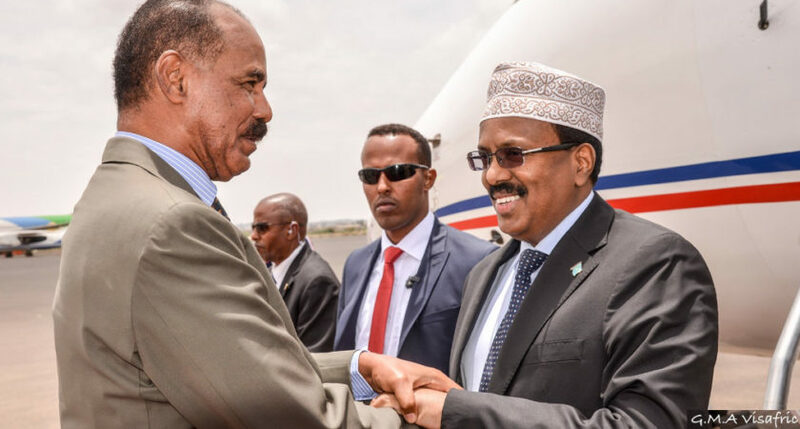 Last week, on 13 December, Eritrean President Isaias Afwerki made a historic visit to Somalia, where he met and held talks with Somali President Mohamed Abdullahi Mohamed [Farmaajo]. 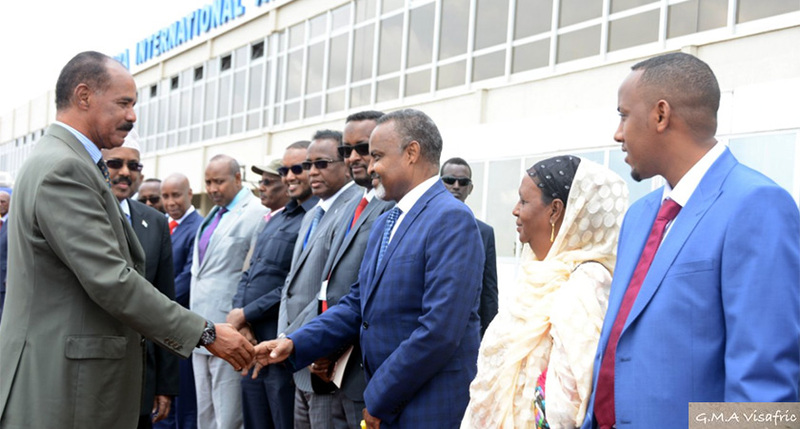 President Isaias’s visit to Somalia was in continuation of the recent consultative Tripartite Summits of the Heads of State and Government of Eritrea, Ethiopia, and Somalia. 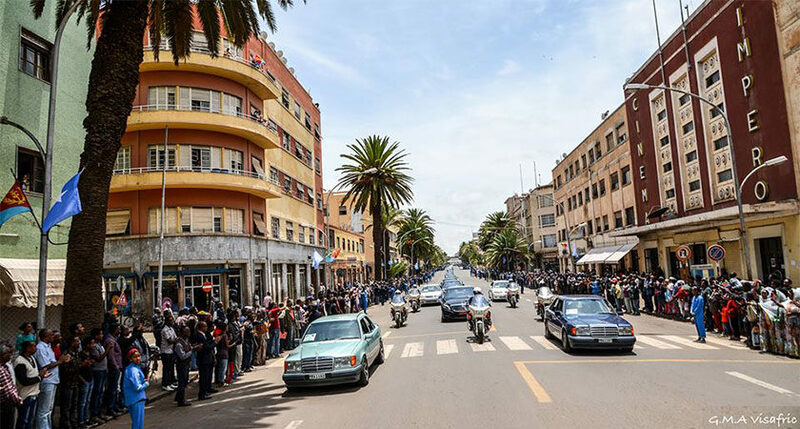 Earlier this year, in July, President Mohamed came here to Asmara, where he met President Isaias and reached an agreement to establish diplomatic relations, exchange ambassadors, and promote bilateral trade. Although the Horn of Africa region has historically been plagued by conflict and tension, 2018 has certainly been a year of stunning developments toward peace and cooperation. Longtime foes have become close friends and partners. 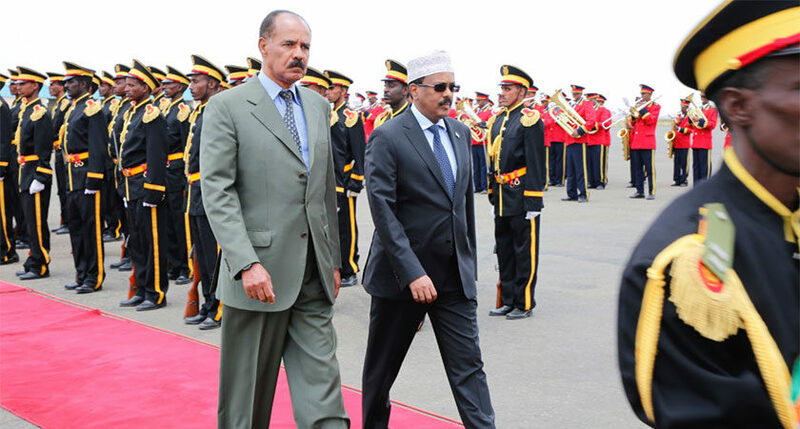 President Isaias’s visit to Somalia should ultimately help to strengthen diplomatic relations between the two countries. Notably, during the visit, the two leaders held a series of discussions about expanding cooperation in security and investment, as well as other issues of mutual interest. 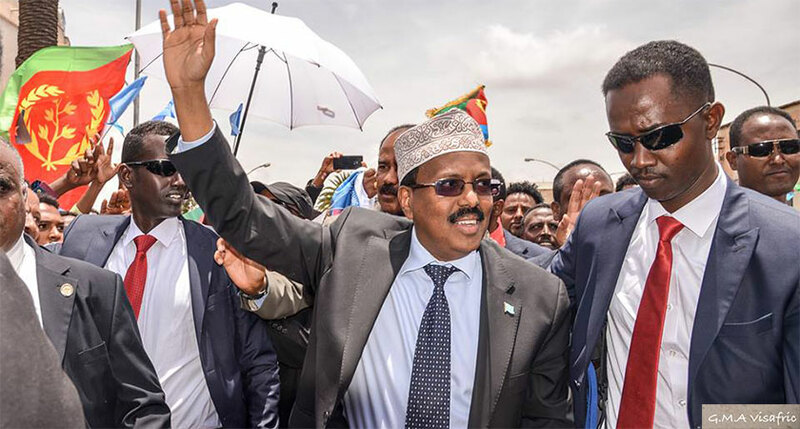 Today, Eritrea Profile is excited to feature an exclusive interview conducted by Eri-Tv Journalist Issak Mehari with Mohamed Abdullahi Mohamed, President of Somalia. Q: Thank you for your time, Your Excellency, President Mohommed Abdullahi. At this time, the people of Somalia are looking forward to a much brighter future. Could you share your thoughts on that? Thank you for being here. 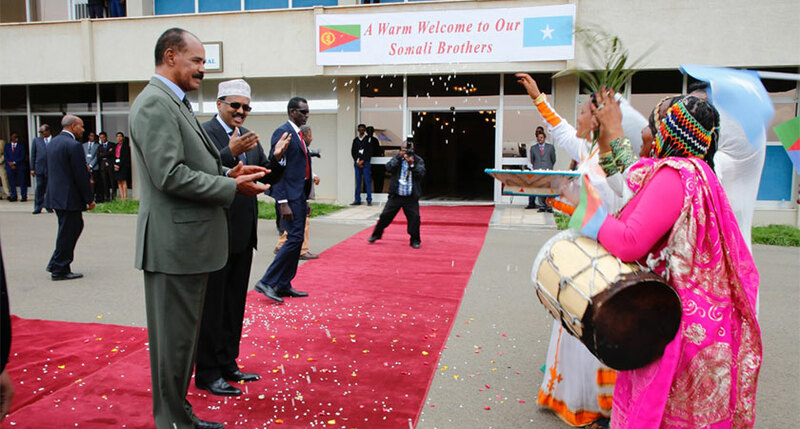 It is a great honor for me to welcome my brother, Isaias Afwerki, to his second home, Mogadishu, Somalia. Somalia has been in turmoil and destruction for close to 30 years now. We have been in office for close to two years – 18 months to be precise. We have made progress in many areas, including security. As you know, we are fighting against extremism – Al-Shabab, who are affiliated with Al-Qaida. What we have done is re-organize our national army and our security apparatus, as well as provide proper training and equipment in order to fight effectively against Al- Shabab. As a result of that, in the last 3 months, we took over a town called Merka, which was previously controlled by Al-Shabab. We are also planning to remove all the remnants of Al-Shabab in lower Shabele and middle Shabele in the next few months, Insha’Allah. 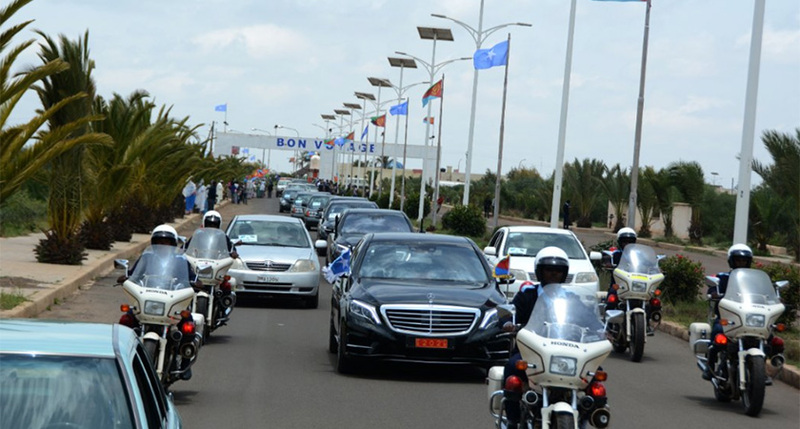 Q : During your visit to Asmara, you discussed a number of issues, including security, cultural affairs, and economics. What is the significance of President Isaias Afwerki’s current visit to Somalia in regard to previous meetings and discussions? While we are improving the security situation, we also have to work on economic development. Working in security and economics, hand in hand, is very important. If you are fighting terrorism, you also have to create job opportunities for the youth because terrorism – Al-Qaida and Al-Shabab – tries to attract the younger population in our society. If we don’t provide job opportunities for them or if we don’t provide hope, there might be some potential that these young people may join Al-Shabab. That is why we wanted to create regional economic cooperation. In order to invite and bring more investment in the region and to work on economic development so that our people will have a better life and job opportunities. That is the reason we came together; to think about stabilizing the region and to work on economic development. To do that, we discussed this initiative. That these three countries can come together and initiate and develop economic cooperation. In the future, other countries from the region will be invited to do the same. If we succeed in doing that, investors from Europe, China, and North America will come here and invest. This will help reduce poverty and conflict in the region. That is the only way to ensure that this region will thrive. This is the first time this region has no tension or conflict. The agreements made by the three countries will certainly help to bring these countries and other countries from the region closer. Q : Regarding the two-day visit of President Isaias Afwerki, what are your thoughts about what is to come in the future? First, I am glad to see that the sanctions have been lifted. There is no way we can talk about economic development when one of our regional states has an embargo or sanctions. 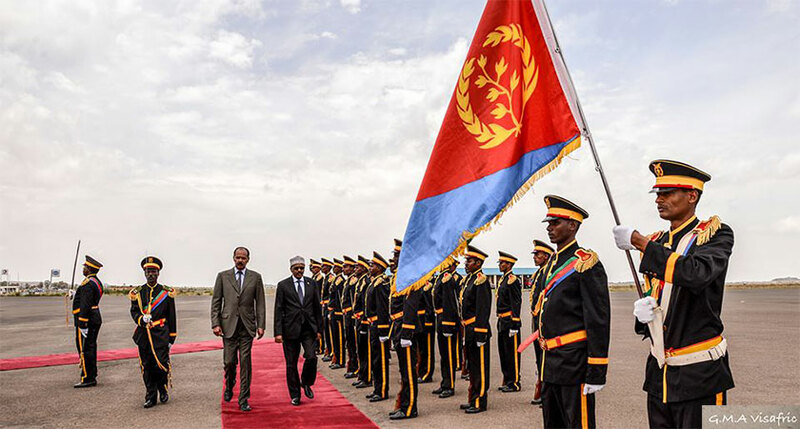 To see Eritrea free of sanction is a goal that the region has achieved. We discussed how we can implement regional economic cooperation. That is why President Isaias is here – to discuss ways and means of how to put our ideas of regional cooperation and integration into action. Initially, it was a beautiful idea to bring this region together. This region is in a strategic location, which has enormous resources and a population of almost 150 million people. The question is how we can benefit from and use all these resources, whether human or natural? We discussed how we can make these ideas a reality. 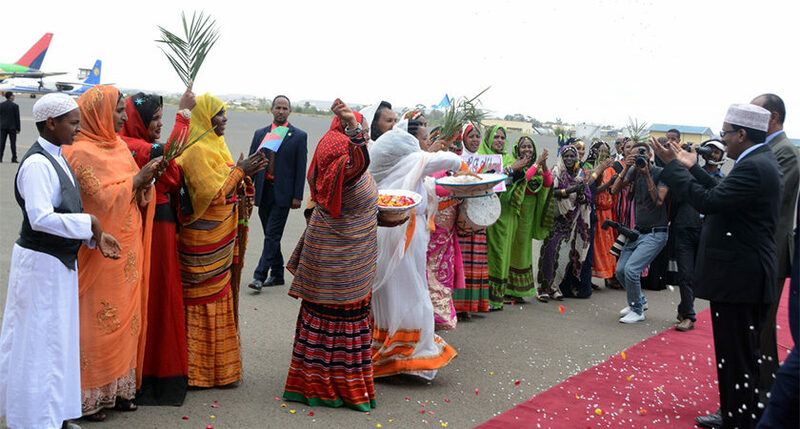 I think we, Somalia and Eritrea, will benefit from this initiative because the Somali people are good in trading and have many years of experience. Also, Somali businesses extend all the way to South Africa, central Africa, and West Africa. This will positively impact the Somali, Eritrean, and Ethiopian people, as well as other countries that join the initiative. This is helpful for our people. And that is what President Isaias is promoting, to make sure that international business communities can invest in the region. This is something that I agree with. Q : Before we conclude our interview, Mr. President, what message do you want to give out to the people of Somalia and Eritrea? 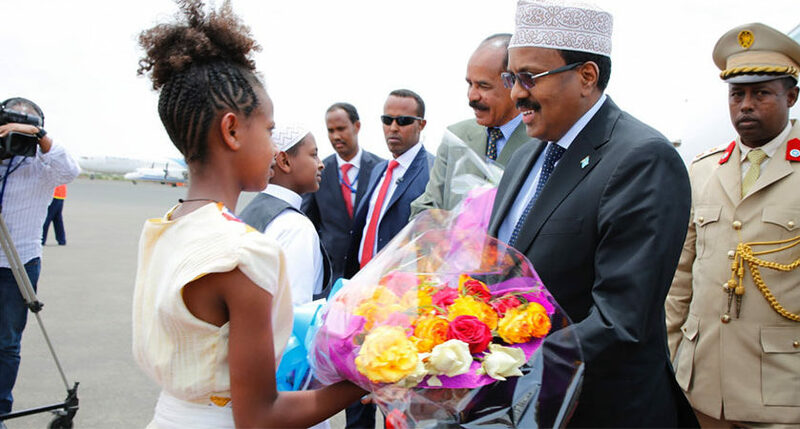 Somalia and Eritrea have a long history of ties and shared values. Of course, Somalia has participated in the liberation of Eritrea for the last 50 years. 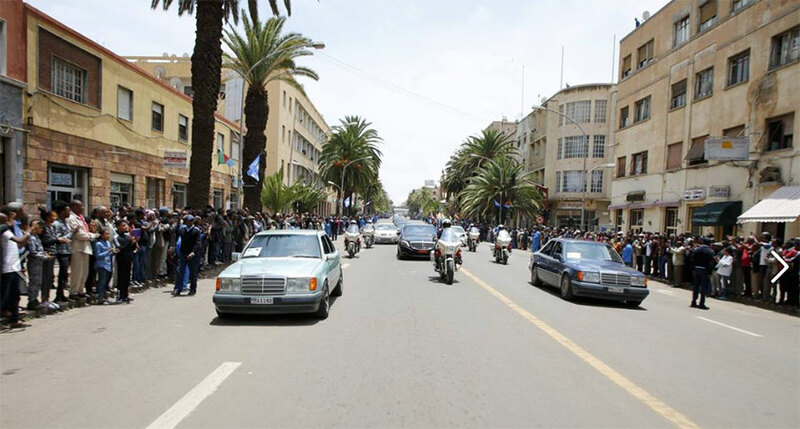 After Eritrea got its independence in 1993, President Isaias and the people of Eritrea have not forgotten their brothers and sisters in Somalia who went into chaos and civil war. 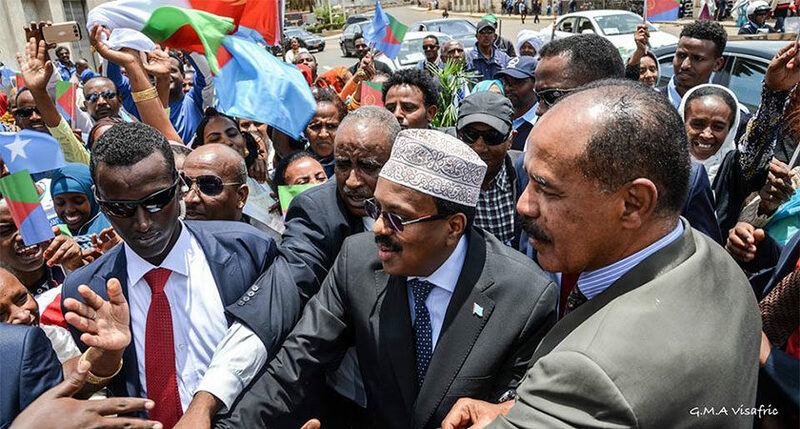 President Isaias and the people of Eritrea have done everything they can to help the people of Somalia, whether through taking part in the Somali reconciliation process or through President Isaias helping warring factions in Somalia to come together to help find common ground. I am glad that finally the two sets of people have found each other. 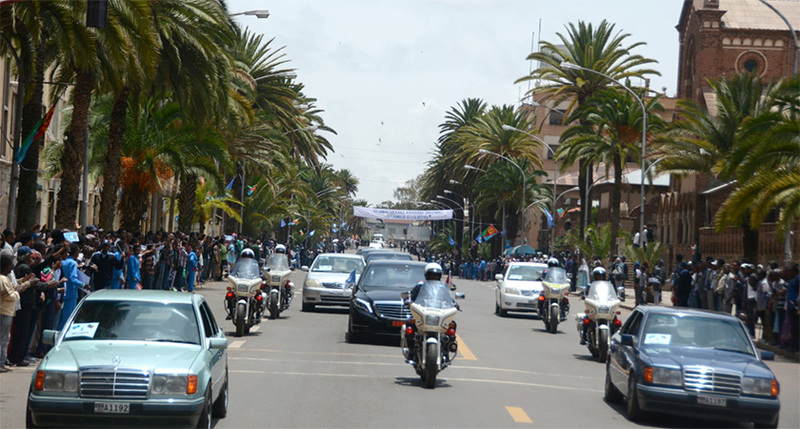 I am also happy to have visited Asmara and received a warm welcome by the great people of Eritrea. 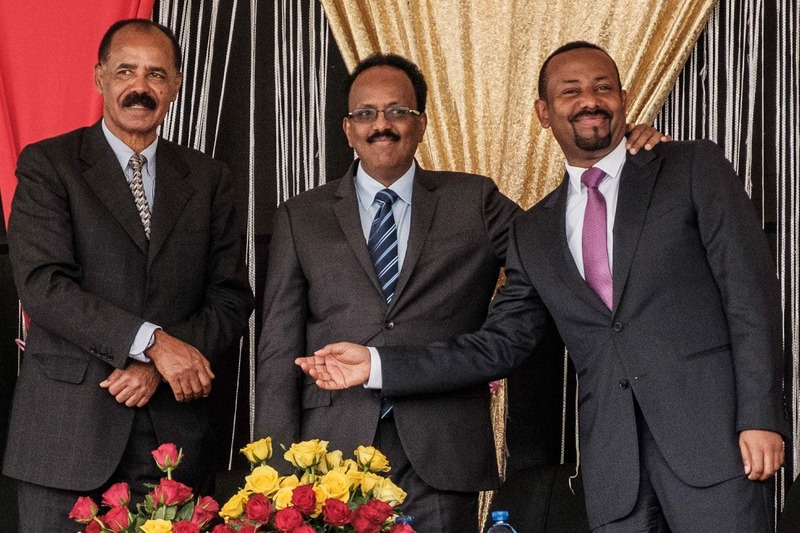 I am also glad to see my brother, President Isaias Afwerki felt the same way when he came here. Of course, it is not his first visit. 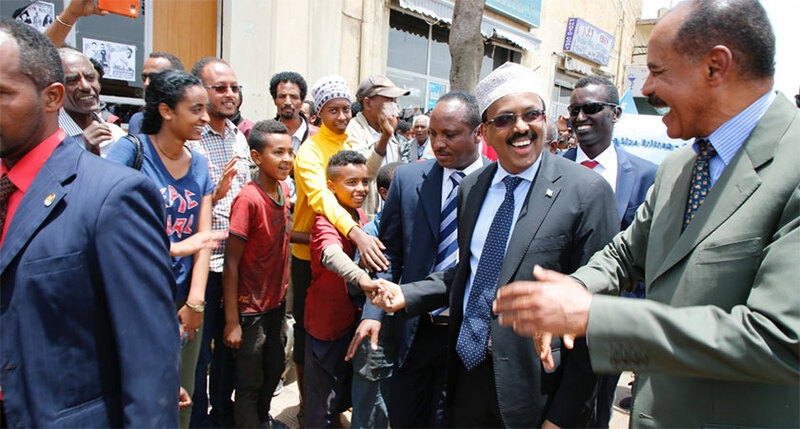 My visit to Asmara was my first visit. I felt very welcomed. The President has been here before, during the struggle. He knows many places in Mogadishu as well as many parts of this country. He is familiar with the Somali people and the beautiful city of Mogadishu. It is great opportunity for all of us to work together for the benefit of our people and the region. Q : Thank you, Mr. President!